We are engaged in offering a wide range of Ammonia Receiver, which is fabricated from thick steel pipe with welded joints. These are precision engineered to stand as per the international quality standards and are available in various standards sizes. Our Ammonia Receivers are available with liquid inlet and outlet valves, drain valve, safety valve, charging valve and gauge glass. Further, these are attached with valves, stands and other standard fittings. The entire range of Ammonia Receiver offered by us can be availed at market leading prices. In addition, our range is checked on various parameters and is tested at 1000 lbs. per square inch hydraulic pressure. 1. We are manufacturers for "sr" brand ammonia valves & fittings, cold storages, milk chilling plants & compressor spare. 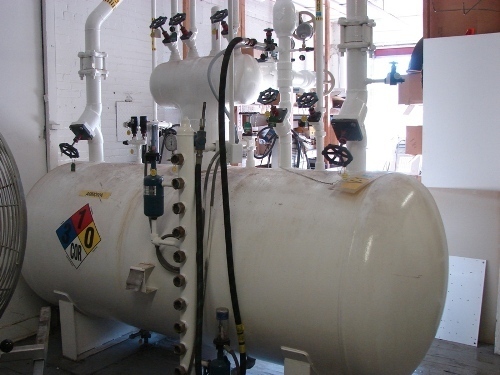 2. we also fabricate ammonia recevier, ammonia oil sepretor, ammonia accumulator, ice cans, ammonia cooling coil, air cooling units, atmospheric condensers, evaporated condensers, cold storages doors & windows. 3. we also do fabrication work at site &also under take turnkey projects. 4. We deals in all types of new/ old plants,all types of machines high & slow speed machines, plants and there spares such as :-kirloskar/ metalax/ sinco/ super/ sra series/ frick/ pc-2/ kafco/ jindal/ metro/ ice hill.